Today's Blog Every Day in November theme in Collections. The other day I showed you some of my flamingo collection. I'm pretty certain I've mentioned my nail polish on here before (last time I counted it was just over 450 but I have since bought polishes. I even bought some today!) and waaayyy back when I mentioned Beanie Babies in this post. But I wanted to show you something that has become a collection and I hope to add to it every year. It's my Books Are My Bags collection of tote bags! This was the first BAMB bag I got, the classic orange design. 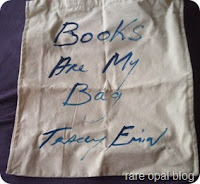 I got it in 2013 from Lahinch Bookshop and I did a blog post about Books Are My Bag then too which you can find here. Last year I got given another one of these totes and a good thing I did and all, because the next day my original broke coming home from work! 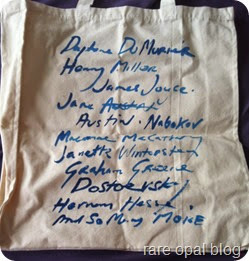 The next BAMB book I got was last year's limited edition Tracey Emin bag. Even though I took photos of it in its current state (which you'll see in the group shot), I showed the original pictures here because I have used it so much it's no longer white! And there are some mysterious stains on it (though my friend thought they were part of the design). I used this almost every day, the quality of the bag is fantastic so it lasts a lot longer. 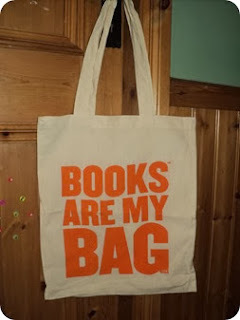 I went all the way to the Urmston Bookshop to get this bag (which they kindly put aside for me) and you can see what else I bought then in this post from last year. I also won another one of these bags but gave it away to a book loving friend. This year there's two designs to look forward to! The one of the right is a Lauren Childs' one that has Lola from Charlie and Lola with the quote 'I am going to the bookshop for one thing or maybe even perhaps a squillion' (I know that mindset!). The other one is this year's limited edition designer bag from Grayson Perry. I got both bags from O'Mahonys in Limerick but I actually won the Grayson Perry one with a colouring competition! Johanna Basford (she of the massive Secret Garden and Enchanted Forest colouring book fame) designed the competition sheets and I decided to stick with different shades of the classic BAMB orange. I love it so much that I might get it printed onto a tote bag for myself! The one BAMB thing I'd LOVE is the mug! I love collecting mugs as much as these totes. You can order them but they're UK only, which I so would have ordered if I was still in Manchester! But while we're on the subject of orange, I was at my aunt's house a few weeks ago and took this picture of some of her classic orange Penguin books. I need to start my own collection I think!